Some people have a positive approach to virtually any situation. They may be embarking on an adventure, choosing a career path, tackling an illness, playing in a sporting competition or whatever. They enjoy finding positive solutions to challenges. Some people succumb to inner or outer pressures. They may worry about what they can’t control, pursue a career path for status rather than satisfaction, continually compare themselves to others or whatever. They focus on the pressures in situations. 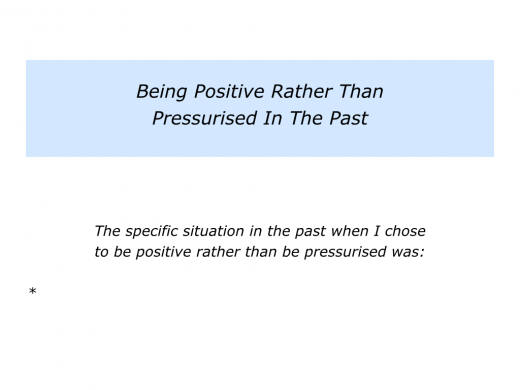 Describe a specific situation in the past when you chose to be positive rather than be pressurised. Describe the specific things you did then to choose to be positive. 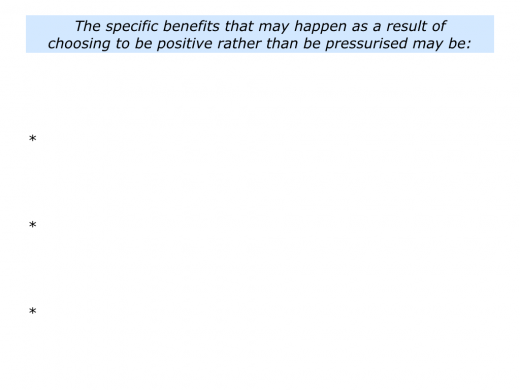 Describe the specific benefits that resulted from choosing to be positive rather than pressurised. During the past fifty years I have met many people who have been positive when facing what other people would call pressure. Many had a common characteristic. Such people aimed to serve something greater than themselves. They aimed to serve their talent, serve a cause or serve other people. They evaluated their efforts by whether or not they had done their best. 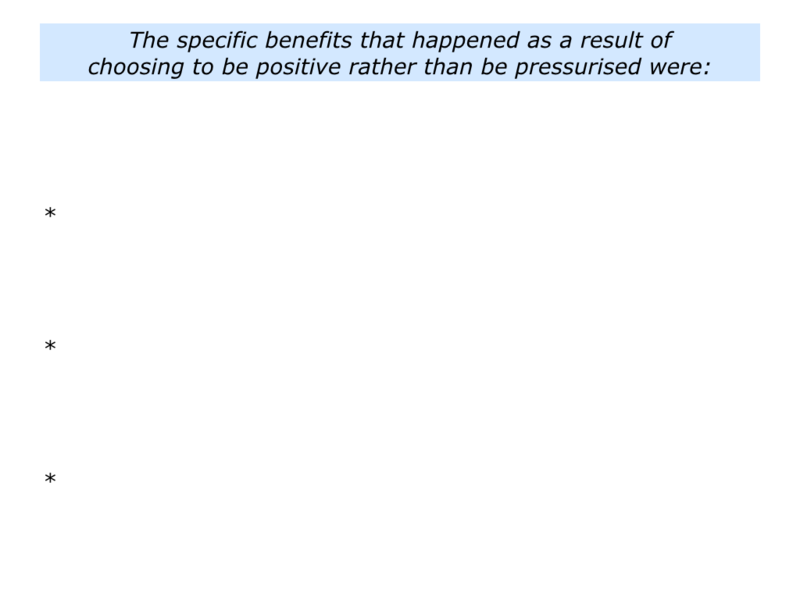 This does not mean they were pushovers, because many were extremely tough. They gained strength by serving a calling that got them out of bed each day. Great sports players, for example, sometimes embrace an interesting paradox. 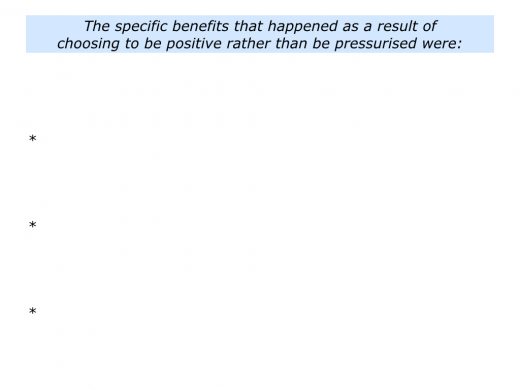 Bearing in mind what they can control, they clarify what for them would constitute performing at their personal best. They translate this into a clear picture of success. Such players then clarify the key strategies they can follow to perform at their personal best. How to make this happen? Some recall times when they have performed brilliantly in the past. What did they do right on those occasions? How can they follow these principles in the future – plus add other skills – to perform at their best? They then pursue their chosen strategies and keep doing their best. Sometimes this involves going beyond Plan A. It means following their previously prepared Plans B, C and D.
Paradoxically, John Wooden’s college basketball teams won more trophies than any other team. 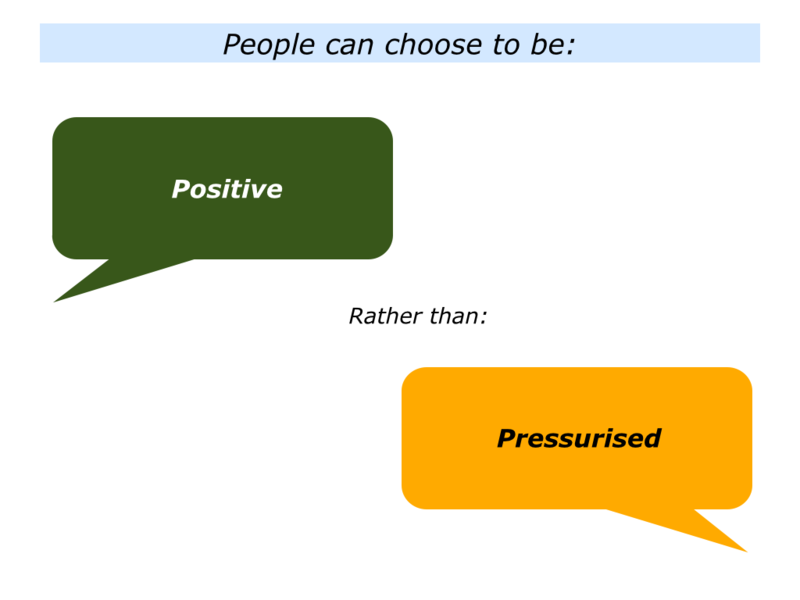 Describe a specific situation in the future when you may want to choose to be positive rather than be pressurised. 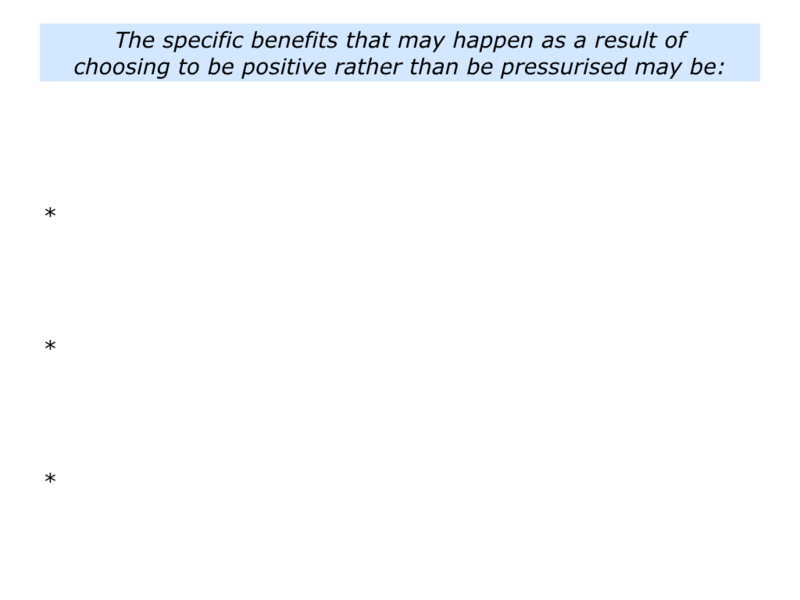 Describe the specific benefits that may result from choosing to be positive rather than pressurised.